I build this simple login script because i was tired of manual logging in every time. I will continue building this script. 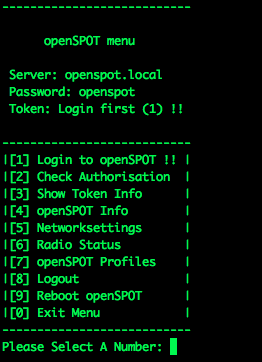 echo "| Login to openSPOT !! |"
echo "| Check Authorisation |"
echo "| Show Token Info |"
echo "| openSPOT Info |"
echo "| Radio Status |"
echo "| openSPOT Profiles |"
echo "| Reboot openSPOT |"
echo "| Exit Menu |"
echo "Get token from sharkRF Openspot"